The cartridge is the electromechanical bridge that carries the music stored in the record to the rest of the system. And as with most bridges, you must pay a toll to get to the other side—even if it’s just a wan smile to the bridge troll. The cartridge introduces much of the distortion in the entire playback system. A tiny electrical generator, the cartridge takes the mechanical energy represented by the record groove and “collected” by the stylus, and with it generates a tiny electrical signal (actually, two—one for each channel) that, when amplified, drives the speakers. This energy conversion—from mechanical to electrical—is called transduction. There are two transduction points in vinyl playback—when the cartridge uses mechanical energy to make electrical energy, and then when the speakers convert the electrical energy back into mechanical acoustic energy. These two points are most vulnerable to distortion in the entire system. Even though, strictly speaking, the cartridge is the transducer, really the entire turntable system should be viewed as the transducer since the fidelity of the electrical signal produced depends so intimately on the performance of table and tonearm. Nearly all cartridges (or pickups, as they were once called) are electromagnetic, working on the principle that when a wire is moved near a magnet, electricity is generated in the wire. Moving magnet and moving coil cartridges work almost identically. What differs is which element is caused to move in sympathy with the stylus: the magnet (in moving magnets) or the coil (in moving coils). In a moving magnet, the stylus is mounted on one end of a pivoted rod or cantilever and a mag net is mounted on its other end, close to a fixed coil of wire inside the cartridge body. A compliant bushing where the cantilever passes into the cartridge body allows it to pivot freely. As the cantilever moves in response to the record groove, the magnet moves in relation to the coil of wire, so generating electricity. 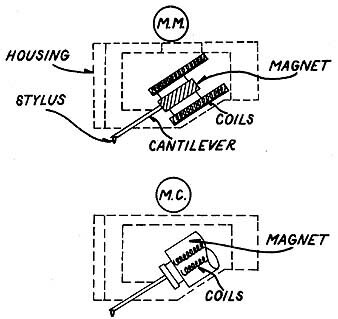 The only difference between this setup and a moving coil cartridge is that the positions of coil and magnet are reversed—the coil of wire is attached to the cantilever and the magnet is housed, unmoving, in the body. Fidelity thus depends on how accurately the stylus is able to trace the groove, how precisely that mechanical action is communicated to or “seen” by the generator, and how much distortion is introduced by the process of transduction. The cartridge’s accuracy in tracing the groove and conveying that tracing to the generator depends largely on the environment provided by tonearm and table. Fidelity depends on the relative motion of stylus to mini-generator. If due to poor tonearm or table stability the cartridge body moves at the same time as the stylus, then the relative motion of stylus and generator is altered and so is the music signal. Unless you have a good arm and table, there is little point in having a fine cartridge, because its quality will be obscured. The cartridge must have the proper environment in order to perform well—its full assets will certainly not be revealed unless the quality of the turntable and the tonearm is at least as good as it is. So until you have a really good table and arm, invest only modestly in your cartridge. Keep your stylus clean and in good condition— a dirty or worn stylus not only degrades sound but, far worse, damages your records. Also, proper cartridge alignment is essential. A table system costing $50,000 or more won’t sound much better than a kid’s toy record player if the cartridge is not properly set up.